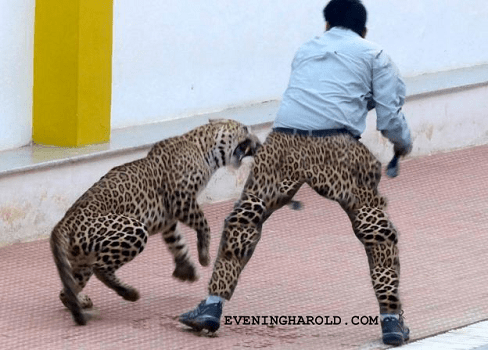 Following the news that the leopard which has terrorised Indian schools has gone missing, popular real newspaper the Evening Harold was today unable to resist the headline: “Missing leopard spotted”. Reaction to the frankly terrible headline was swift, with many readers protesting by burning their copies of the newspaper. Many bought extra copies just to burn them, leading to the highest circulation ever seen. Readers of the online edition of the Harold were quick to burn their laptops, and Stephen Fry quit Twitter, as usual. A spokesman for the Harold tried to insist the whole affair was a simple mistake, claiming that the headline had meant to refer to a missing leotard. No-one believed him, but everyone stopped protesting and went off to think about leotards for a bit. A representative of former Star Trek actor Leonard Nimoy had no comment to make, other than noting that his client died last year and he expected better of us.